What have we been up to June 2017? At the end of the month I always try and do a stock take of what actually happened that month. The first thoughts that seem to come to my mind are "It was busy" and "I can't remember". It is always the same thing, every month. But of course, we did do some fun things and I do remember some bits and bobs and we did get our family portrait done too. Other than that we have been planning our summer a bit. Camping is one thing we are planning on doing now. My passport is out of date and we went and bought ourselves a tent! We've also been stressing a bit over our daughter's future class allocation. She has been placed in a separate class to her best friend, and we have discussed with the teachers why this has happened. And while there are some things they have said that makes me understand their point of view it is still sad. Apparently the girls sometimes can exclude others from play and be a bit mean to others when together, and they chat rather than concentrate on classes. It's a difficult situation. What would you do? 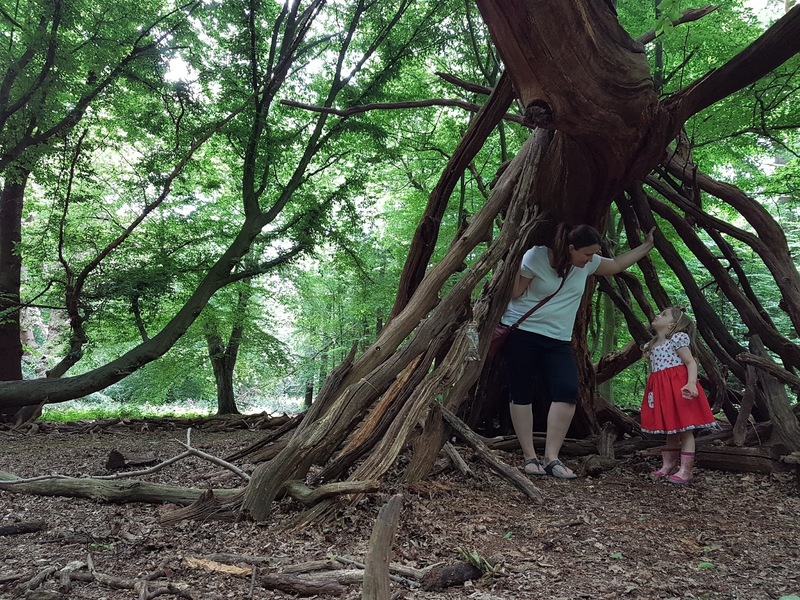 planning our camping trips, purchasing a tent, pinning lots of family camping ideas on my Pinterest... generally getting enthusiastic about camping which I thought would never be me! learning about Pinterest and really getting into it - I have done a mini-course on Pinterest and how to use it properly as a blogger. watching Luther - I am so into this programme. Thanks Netflix - always something amazing to watch! drawing, drawing, and drawing, everyday. We have bought a ream of paper and much of it has been spent already! There are lots of princesses being drawn, and Elsa, Anna and Rapunzel. princesses. Her school nursery teachers say that you can get Aili interested in ANYTHING as long as it includes princesses in it. making fake snow with her daddy for the birthday party. And playing with it of course. her birthday party of course! And the Elsa cake - that drew so many gasps. painting her nails with bright pink, and generally being a very girly girl. wearing dresses to school, and dresses everyday. If she could choose, she would wear a dress EVERY day. going to the gym and working hard on HIIT type of stuff. getting more graphic design freelance work. going to the beach with Aili. checking out tent specifications and planning which tent to buy. 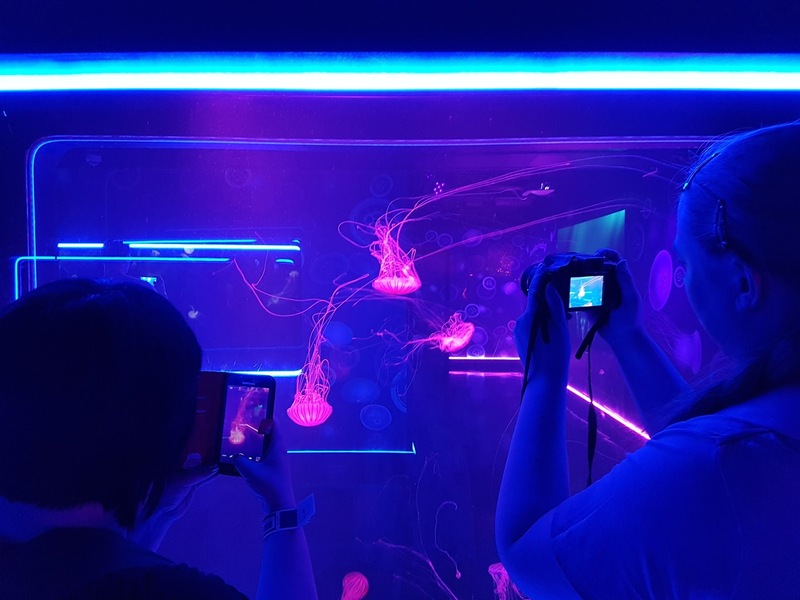 What is the new jellyfish exhibition at London Aquarium like? I've been to the London Aquarium a few times now. 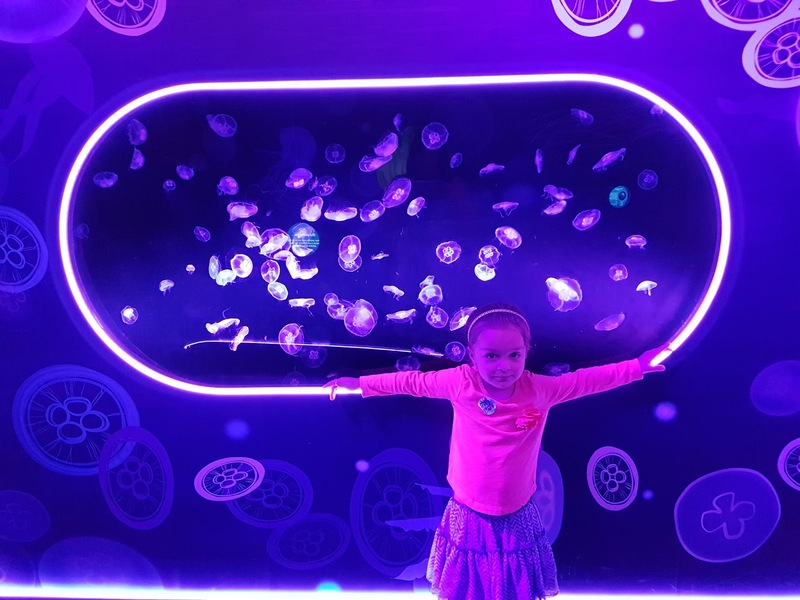 Recently we were invited by 365 Tickets to experience the new London Aquarium exhibition - Ocean Invaders, the brand new jellyfish area that opened this spring 2017. I've really enjoyed visiting the aquarium in the past. 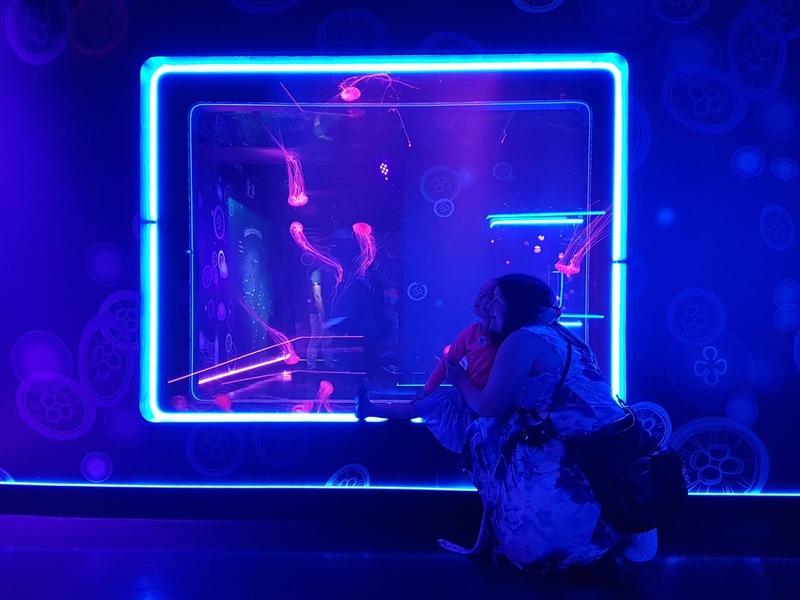 Walking around the huge shark tank, being able to see manta rays being fed, petting a starfish, checking out the numerous little fish, everything. There's even a crocodile and penguins. 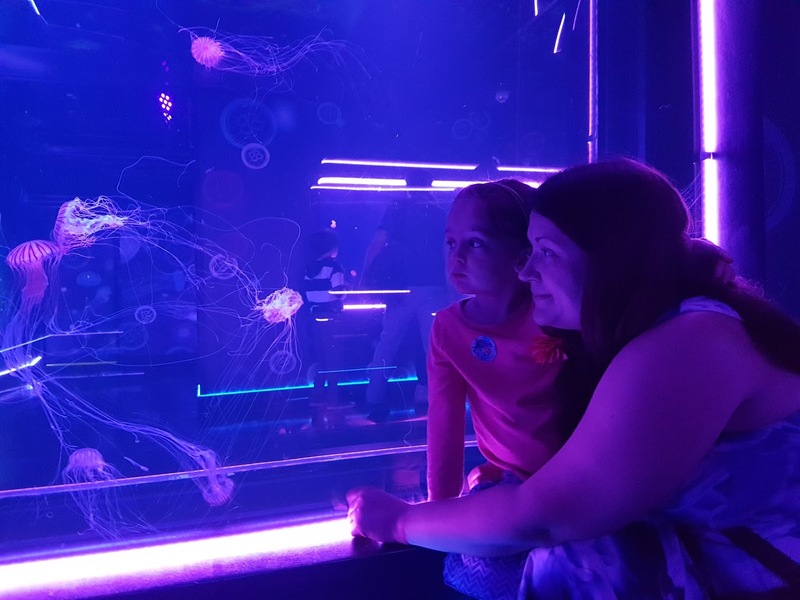 Now there is a new section to the London Aquarium, wholly dedicated to jellyfish. The Ocean Invaders section is quite funky. 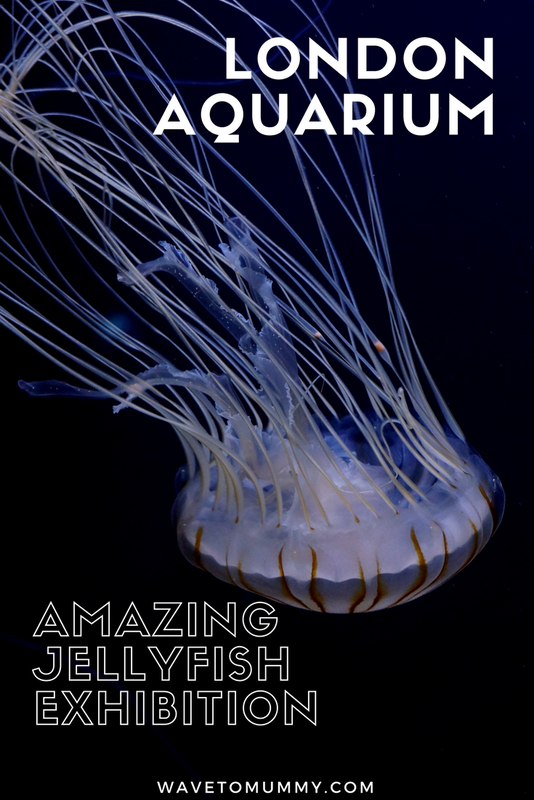 You can learn about the jellyfish, facts such as that there are over 2,000 species of jellyfish, of which only 70 are dangerous to humans. 97% of jellyfish is water, and they have no hearts, no blood, no brain, and no gills. They range from tiny pinprick sized to ones that are bigger than humans. Scientists believe that jellyfish have been floating around Earth's seas for 500 millions years now. To put that into context, they've been out there well before the first amphibians crawled to investigate what land had to offer them. At the exhibition you could try out what a jellyfish sting feels like. As I've been stung by jellyfish a few times when out diving I didn't try it there as I already know from experience it is quite unpleasant! Not huge amounts of pain but certainly stings you a bit. Watching the jellyfish floating around is really quite mesmerising. I could have spent a long time just watching them there - there is something very graceful in the jellyfish when they move through the water, with their tentacles gently swaying behind them. The look of amazement on my daughter's face was great to see. The jellyfish were illuminated in the exhibition, in some sections with changing colours making it quite fun to watch. In some sections you could even change the colours yourself - my daughter, quite naturally, chose pink for them. 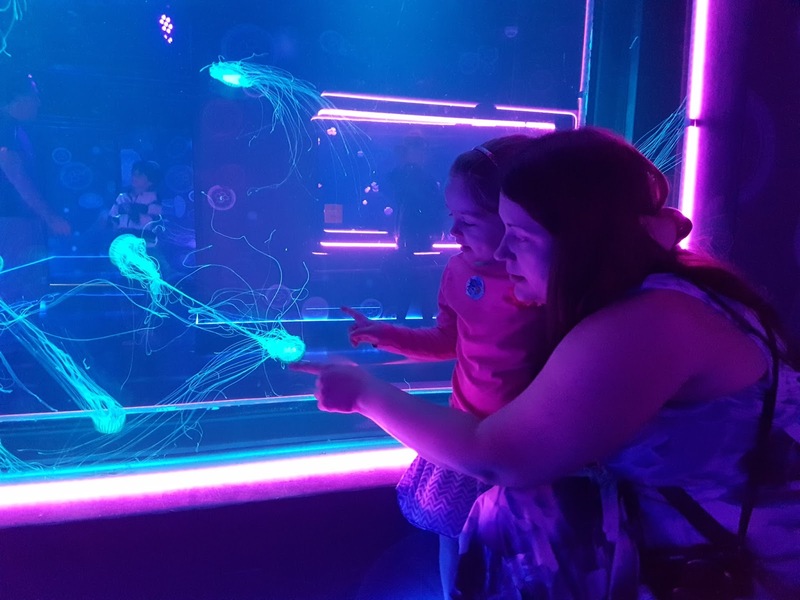 So should you go and see the new Ocean Invaders jellyfish exhibition? 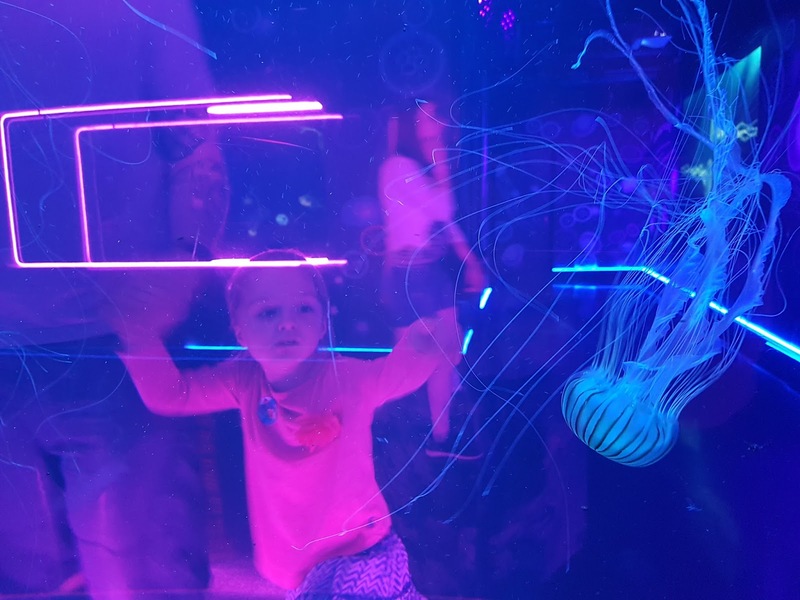 Even if you have been to the aquarium before, the new jellyfish exhibition is quite something and in my opinion, worth the visit. I would recommend spending a good amount of time there. 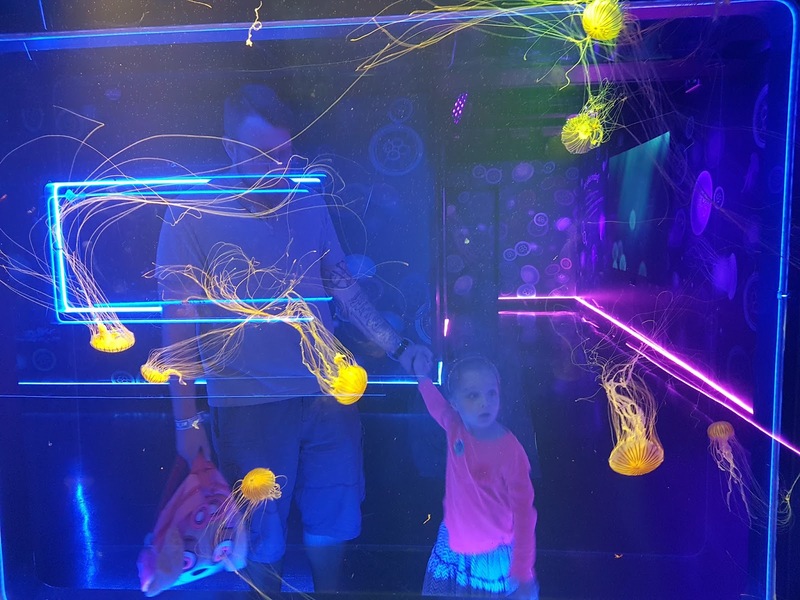 We had a manic four year old with us, so we couldn't read much about the jellyfish as we were just running after her... That said, the jellyfish were stunning and it was great to admire them, even if at great speeds at times. The exhibition was surprisingly big as there were lots and lots of different species, making it even more interesting. I had no idea there were so many different ones out there! So yes. Go and see it, and come back to tell me what you thought of it! Or if you can't, watch my video and let me know what you think of it. Have you been to the London Aquarium before? 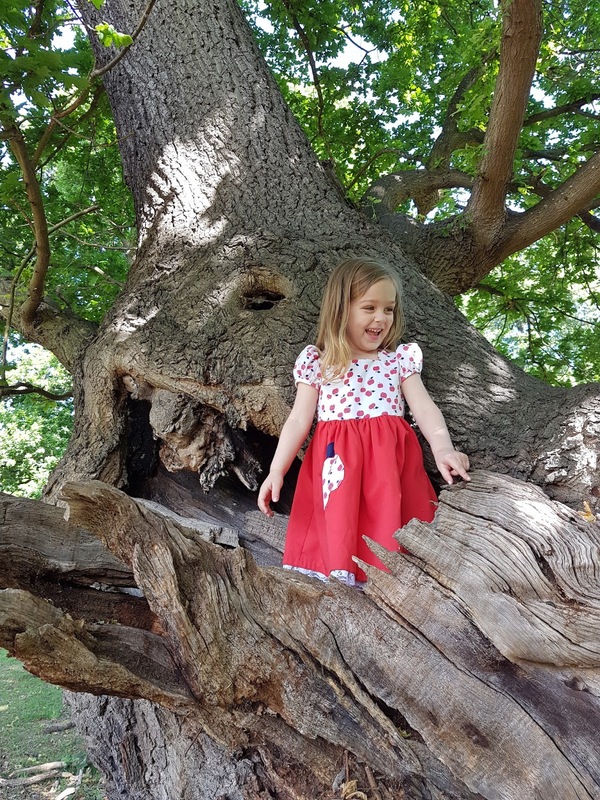 When I first started my blog one of my favourite things to publish were my daughter's outfit posts. I loved selecting her nice combinations from her vast wardrobe. I think it is quite common isn't it, when as a mum your body is constantly changing and your own wardrobe is constantly in a state of flux. You know that at least the clothes you got for your kid will always fit and look nice, whatever the day is. 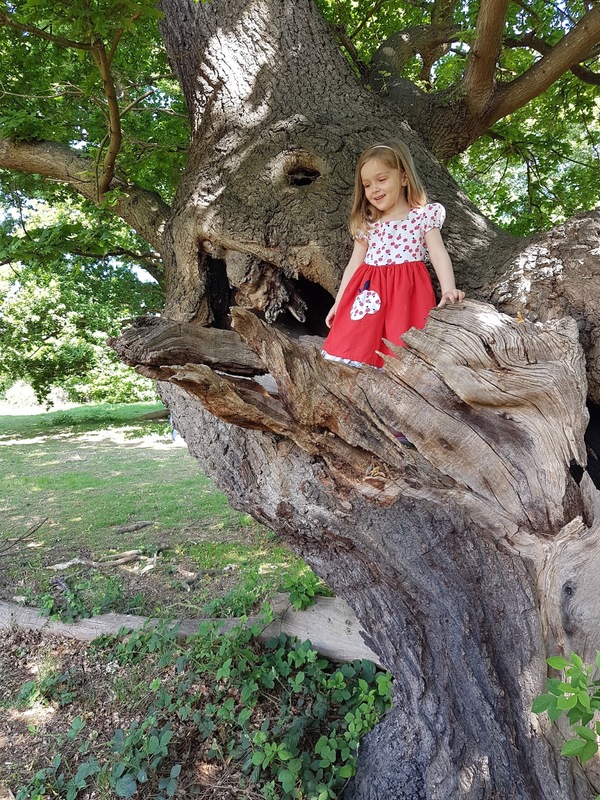 But I haven't published any of these outfit posts of my daughter for ages now. I absolutely love looking back at them - not so much for the outfits, but because when I did these posts regularly, I always had some nice regular portraits of my daughter. Over the course of the year I could really see the change in her, as she grew and developed, as I had photographic evidence of it every couple of weeks. So I figured - it would be nice to try start doing a bit more of these again. Not every week of course - our weekends tend to be pretty hectic and I often forget to even take out my camera. And let's face it, trying to cajole a fournado into standing still long enough to capture a relatively non-blurry photograph ain't easy. I couldn't afford the weekly chocolate bills for one! What do you guys think of double (or triple) denim? 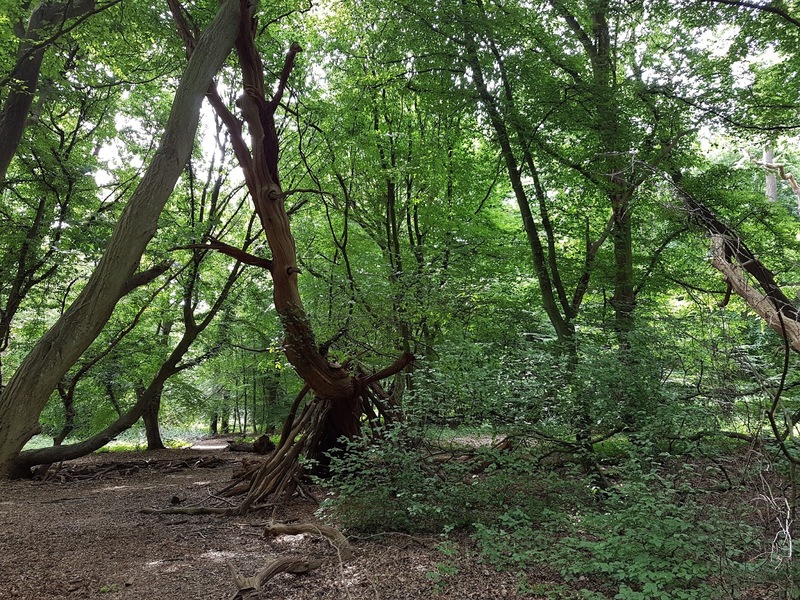 Epping Forest is quite a gorgeous location to stroll through, as we discovered recently. 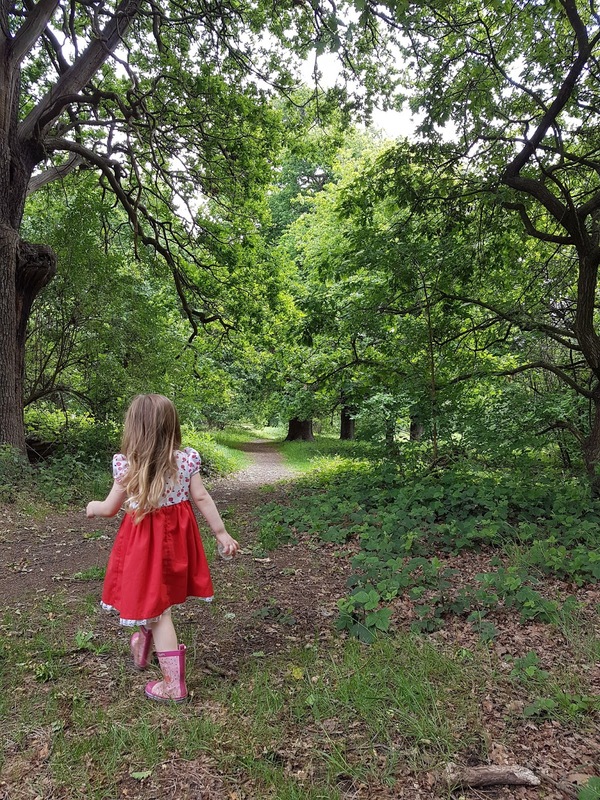 For a metropolitan city, London has a surprising amount of woodlands areas and humongous parks to get your forest bathing on. 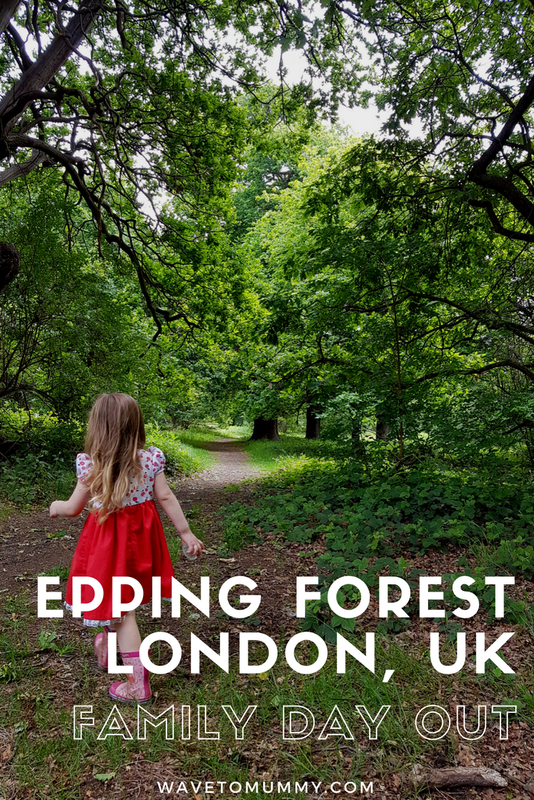 I have never been to Epping Forest though. 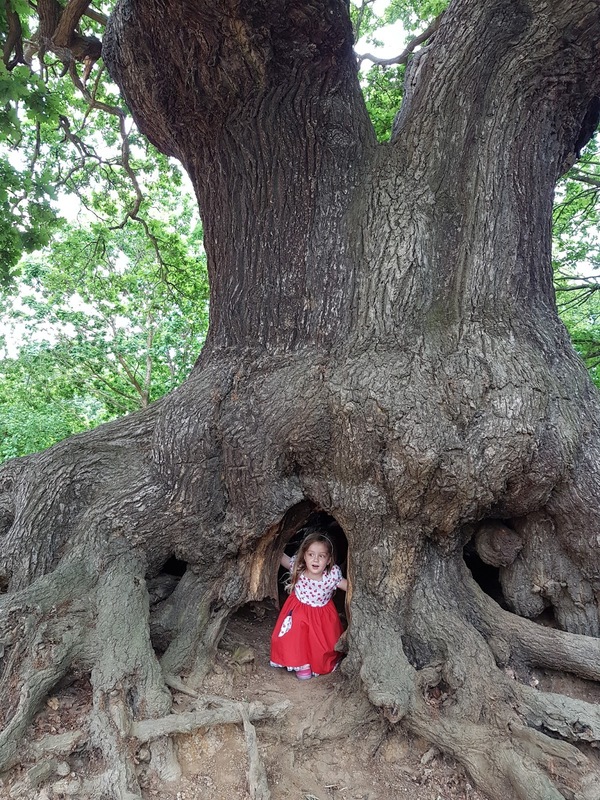 Despite having lived in the general vicinity of Epping Forest for nearly eight years, we visited it for the very first time just a couple of weeks back. And it wasn't even out of our own volition. It was a forest school, organised through the bilingual Saturday school we regularly attend. 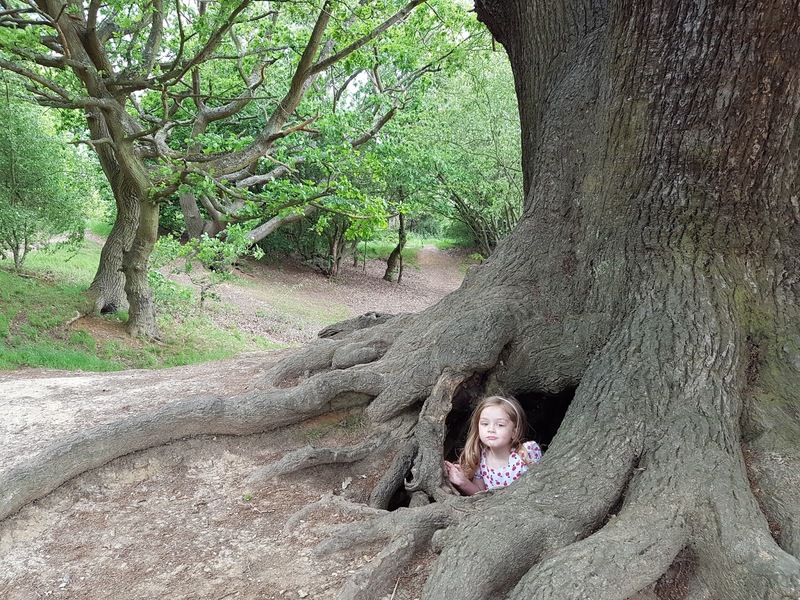 We started our walk from the Epping Forest Gateway, which is near Queen Elizabeth's Hunting Lodge. Next to the lodge is also a nice cafe called Butler's Retreat to end the day in. Chingford, the town nearby, looks also pleasant and a nice place to stop for lunch. 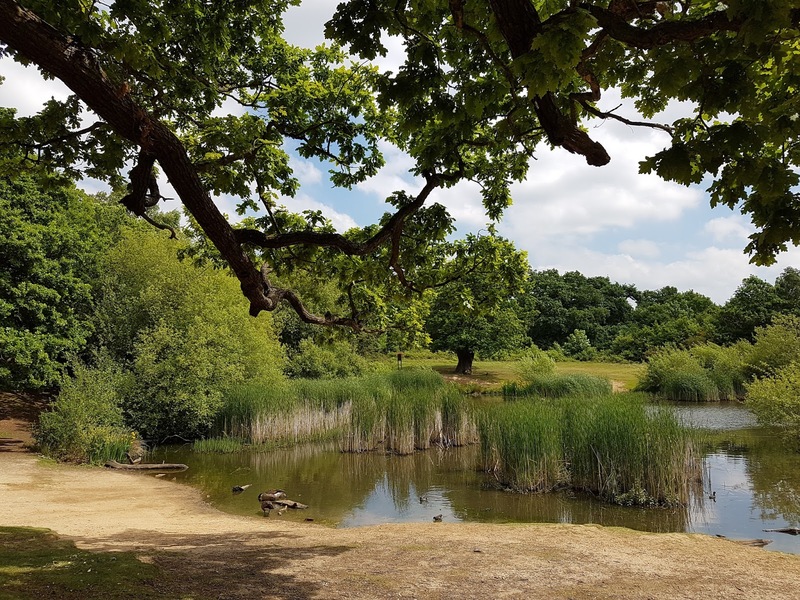 Anyway, Epping Forest is just about 20 minutes drive away from ours, perhaps not even that. 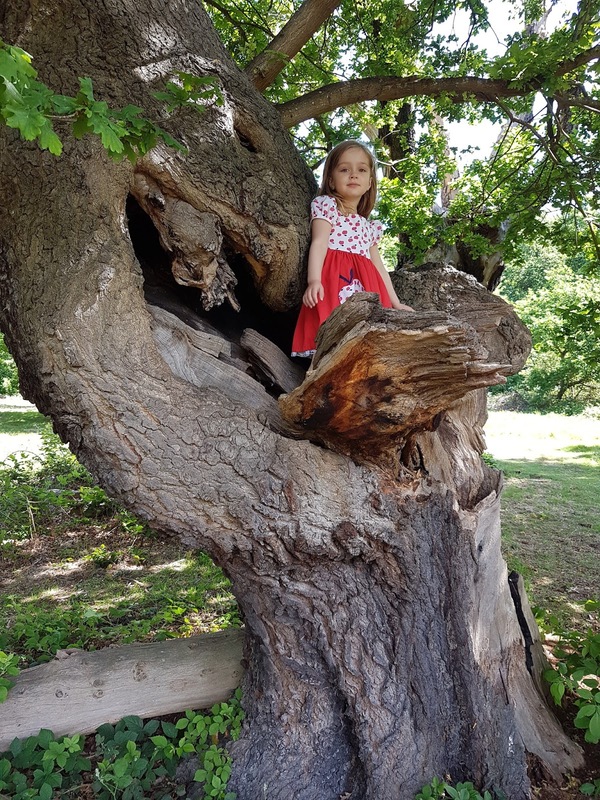 For whatever reason we have never went for walks there, but have favoured Whitewebbs, which is perhaps a little bit closer to us, again, again and again. We have been to Whitewebbs to hunt Easter eggs, to celebrate Mothers Day and to just walk around after a gigantic meal in their Toby's Carvery. 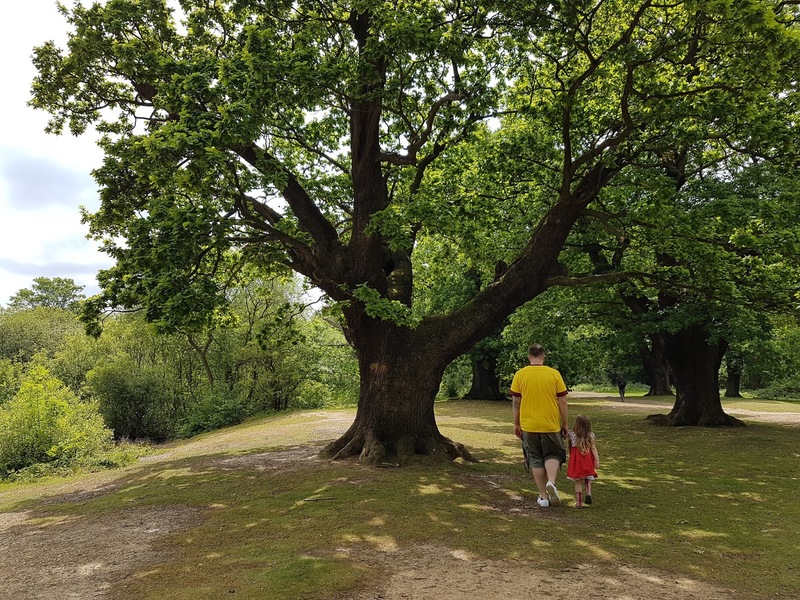 I thought it was a great place for a family day out, with plenty of easy walks and gorgeous greenery to enjoy, and lots of pleasant places to stop for a picnic. I think this will be one of those places we will have to visit again, perhaps take a picnic, or even treat ourselves to a nice pub lunch afterwards. Sounds pretty good to me! What is your favourite forest to walk around in? You are at that funny age now. You are so big and so independent, yet you are still so little. You constantly tell us you want to do it "by-a myself!" and you insist on doing everything by yourself. I love that you are making your own decisions. Unfortunately, when it is a decision such as wearing a summer dress on a chilly day or choosing to eat only cereal for breakfast, lunch and dinner, it often ends up in a shouting match. As you, quite naturally, want it your way because well... You are four. And you want what you want. We just want you to be dressed, fed and healthy! And preferably go about it a bit more quietly. I think you are so keen because you miss me a bit during the week. While I get to spend those mornings with you and drop you off to pre-school, by the time I get back home from work you are already in bed, and we are left just the weekend. So quite naturally, when I am here, you want me, me, me, no matter what time it is. You are obsessed with baby bunnies, Frozen, Paw Patrol and puppies. 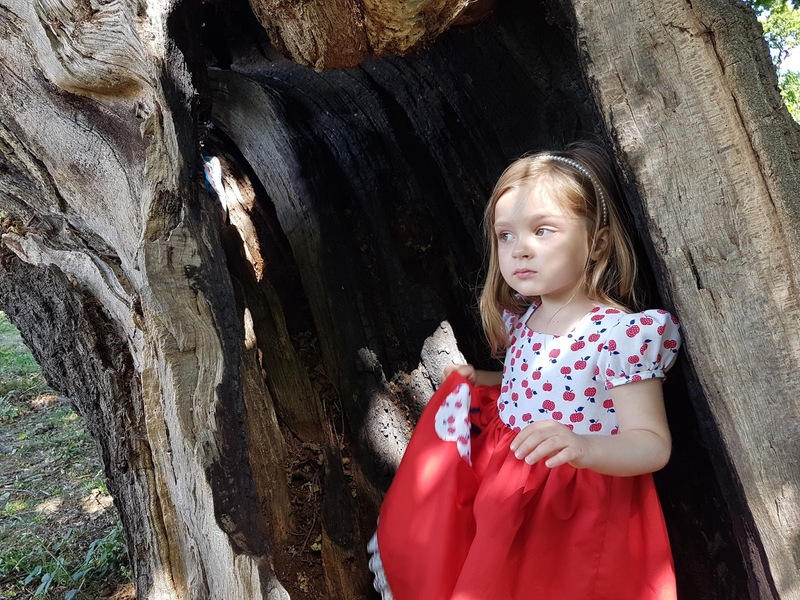 Frozen and Elsa was your chosen birthday party theme, your favourite TV programme is Paw Patrol and one of the only guaranteed ways of getting you to be quiet, and you love to hop to school, pretending to be a baby bunny when we walk up there. You love all kinds of baby animals, and love pretending to be a baby bunny, hopping away, or a baby horse, neighing in a squeaky baby voice. I am of course, depending on the situation, a mummy bunny, a mummy horse, or occasionally a mummy dog. I love this game a lot, although your daddy doesn't, as he thinks it gets you a bit over-excited and silly. And fair enough, it does a bit, but it is still fun! One thing you have been talking over and over again is babies. There have been a few new babies amongst the wider family, and our friends in the last year or so and you just love them. You constantly talk about how they are "sooooo cuuuuute" and "soooo delicate". You have told us that you want to have a baby sister AND a baby brother. Twins. No tall ask that is! You've also told us that when you are a mummy, you will have ten babies. All at once. You definitely love babies! Pre-school has gone really well for you. You have lots of friends, and you are a popular girl both at your school, at your ballet class and at Montessori. 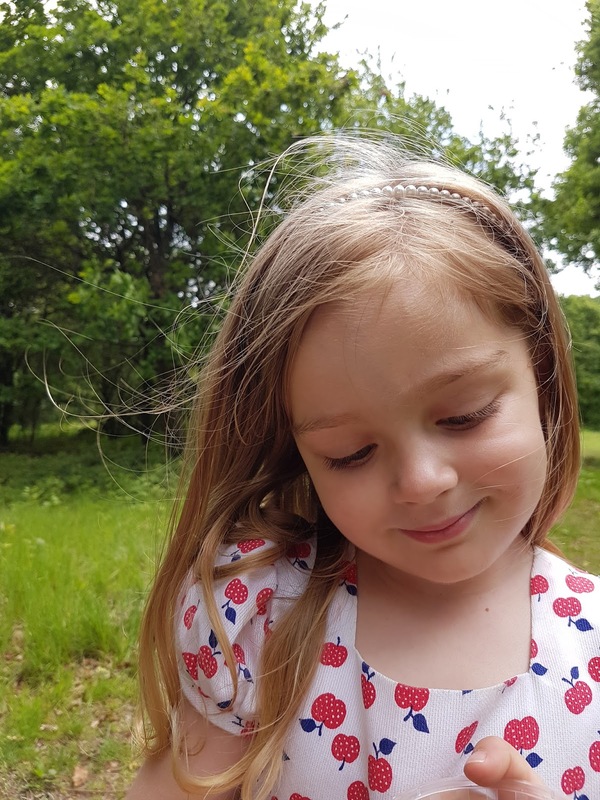 At one of your development meetings at pre-school, we were told that empathy was one of those things we should try and encourage in you, and after lots of talks about feelings and how other children perceive things you do, we are happy to see that you have blossomed into a genuinely inclusive and friendly little character. You play with others nicely, and insist on including everyone in play even when others might turn their backs on them. Not to say you are always sunshine and lollipops, you aren't, but we are getting there. You are very excited about going to the big school next year, and so are we. We spoke with you which school you might like to go to, and you said you preferred the one where you are now, with the friends you have, so that is the one we chose for you. I hope it goes well and you will enjoy it. I had to change schools twice in my first year and I am glad you have a bit more stability, and you will already know some of the children there. 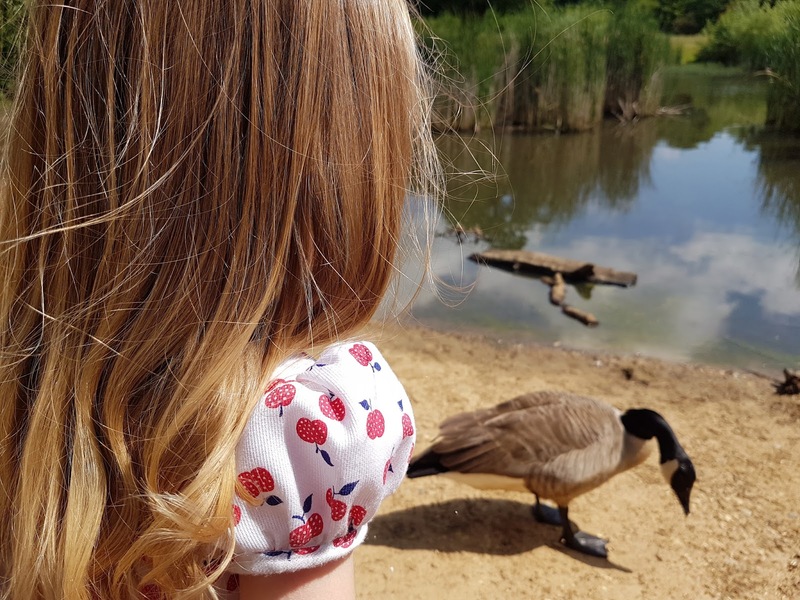 You love going to the park, you love doing crafts, you love drawing and colouring in, and you also love doing your "exercises", something you mimic from your dad who has really got into going to the gym recently. You love going to the bath, and you always pretend to be a mermaid there. You love me and you love your daddy, and most of all, you love giving us cuddles and kisses. I love how you sometimes just laze in our laps, watching telly or videos on YouTube. There are so so so many things I could tell you about us, about you, and about the way I feel about you. But I will tell you just one thing. The thing I tell you every day. Mummy loves you very very much.